Sanxia is located in the southwest corner of the Tai­pei Basin. Mountains rise on three sides and to the west it faces the Da­han River Valley and the coastal plains. Passing through the vicissitudes of a century, the town long ago outgrew its earlier role. Yet a deep, rich cultural heritage has helped to contribute to the unique characteristics and charming appearance of the place today. 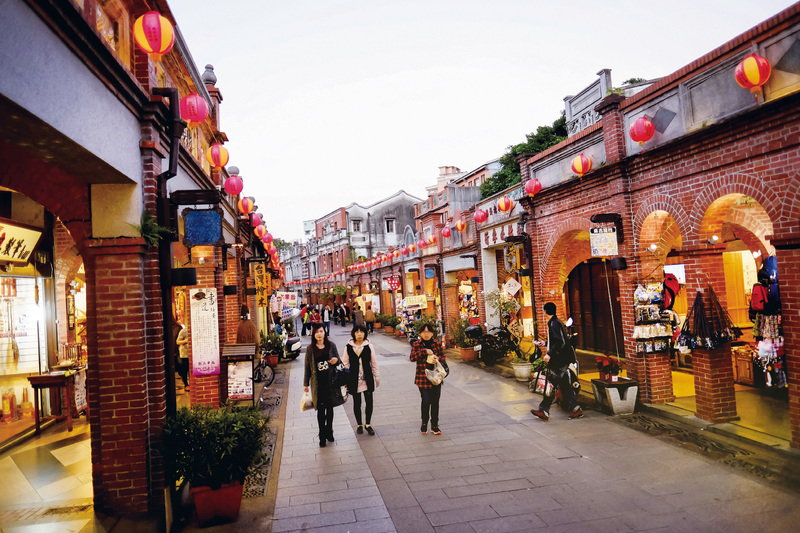 Strolling through San­xia’s red-brick covered walkways, one can see Baroque-style decorative facades glimmering in the afternoon sun. From the Qing Dynasty on, San­xia’s auspicious location and rich natural resources allowed it to rise up as a hub for trade along the local rivers. The trade in tea, camphor, dyed textiles, lumber, coal, and other goods favored the growth of local industry. Businesses sprang up along the streets that now form the old quarter of the town, which became a prosperous commercial center. During the Japanese colonial period, major renovations in 1915 resulted in the architecture still visible today. Because its fortunes were built upon riverine trade, however, San­xia lost its significance as a commercial hub due to the construction of irrigation canals and the completion of transportation networks on land. With the ageing of the structures, many merchants eventually moved out, and for a time the buildings faced the possibility of demolition. In 2004, however, the government initiated a renovation project, and a rejuvenated old quarter was unveiled in 2007. New shops opened up in the old buildings and tourists flooded in. Sanxia entered a new chapter in its history, one that preserved the charming appearance of its past. Because of the ease of transportation, available water supplies, and ample crops, San­xia was once the chief center for textile dyeing in northern Taiwan. On close inspection, one can still see the names of dyeworks on the facades of the old town. But although commercial indigo dyeing has waned, many have taken up the job of preserving its history. 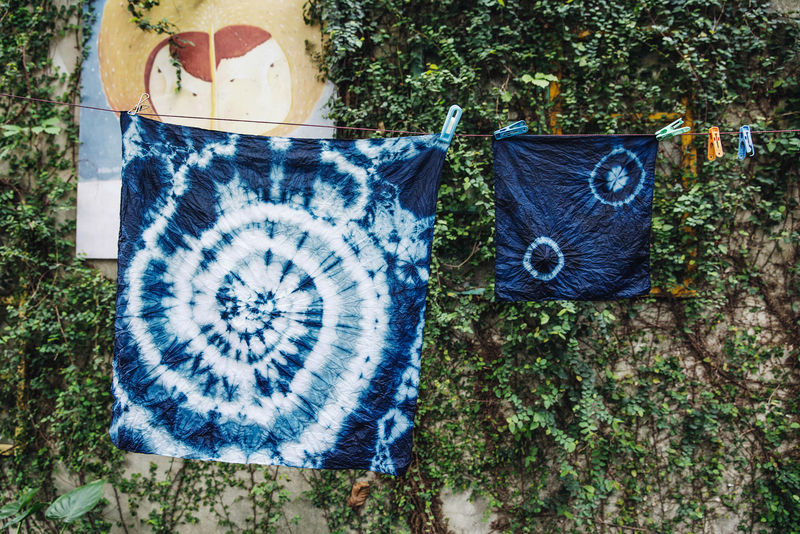 Only through this meticulous process can the ideal indigo colors be produced, allowing master dyers to use their various techniques to create works of great originality. For generations, Zu­shi Temple has been the chief religious center for San­xia, Tu­cheng, ­Yingge, Daxi, and other nearby towns. Rebuilt for the third time in 1947, the construction was led by local artist and professor Li Mei-shu. The temple combines unique architecture with splendid works of art—carvings in stone and wood and copper engravings. 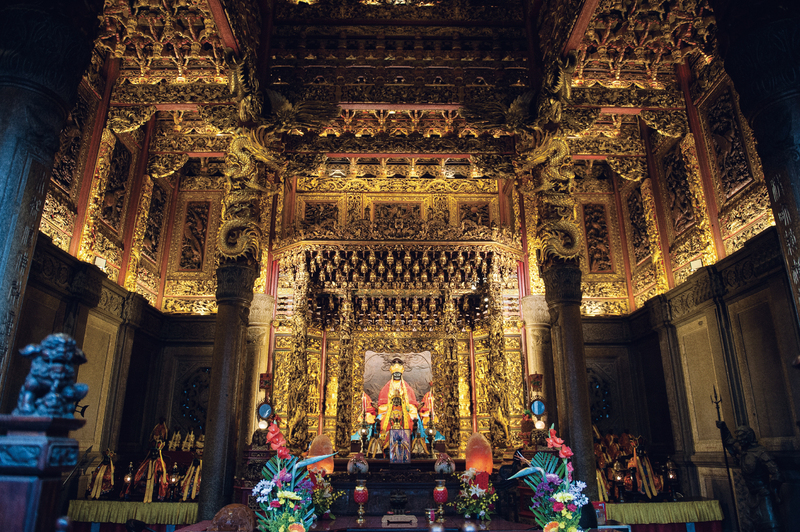 It has earned a reputation as a “temple of Eastern arts” and teems with life even today. 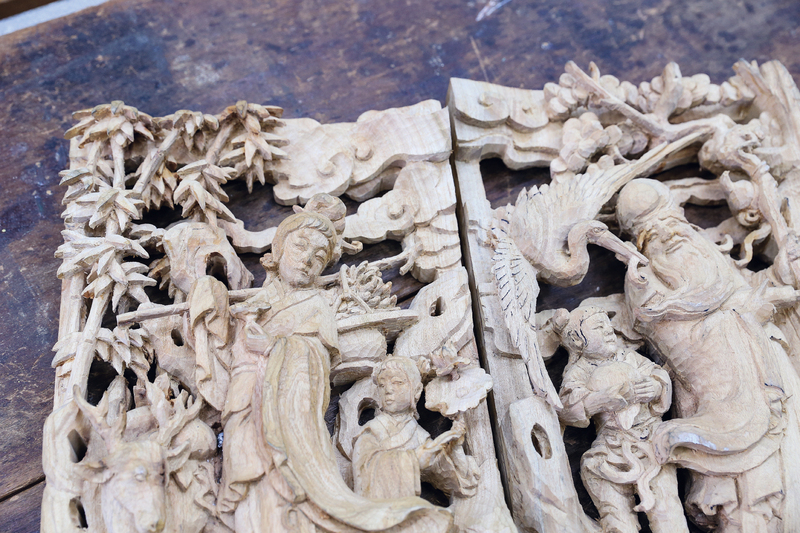 Woodcarving master Hong Yao­hui, who worked on the temple reconstruction from 1986 to 2001, began apprenticing as a wood carver after graduating from junior high school. 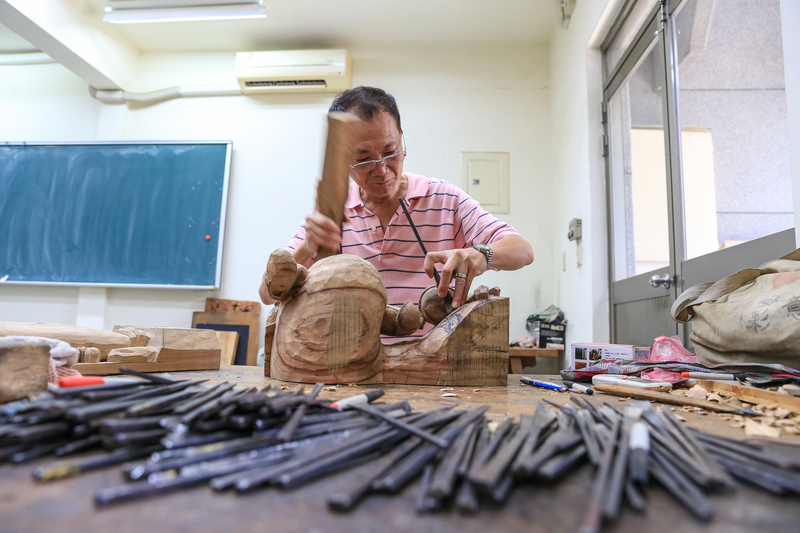 He has traveled all over Taiwan with his teacher, working on wood carvings at various temples and developing a solid foundation in his craft. Today there are few young people who want to study the craft. After more than three decades of experience, Hong knows the hardships involved. Yet devoted to the mission of passing on his skills, he offers university courses in the hopes of finding students to carry on the tradition. 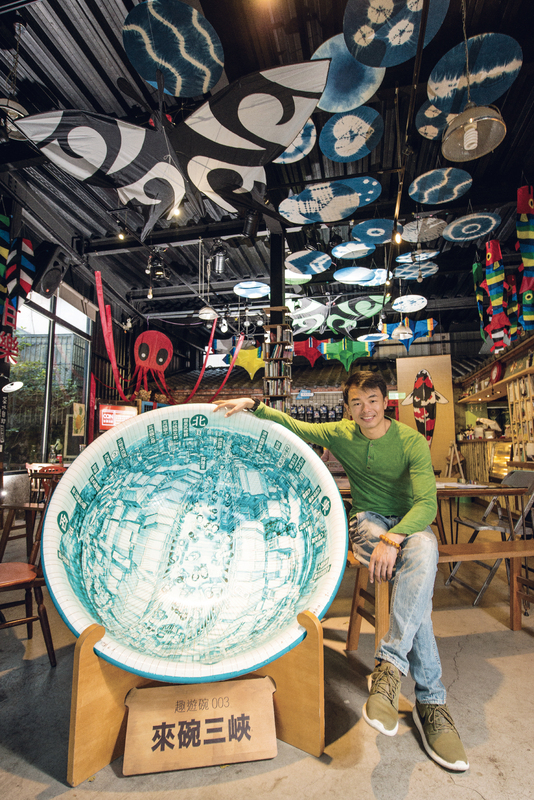 When ceramics are mentioned, people immediately think of the town of ­Yingge, next to San­xia. 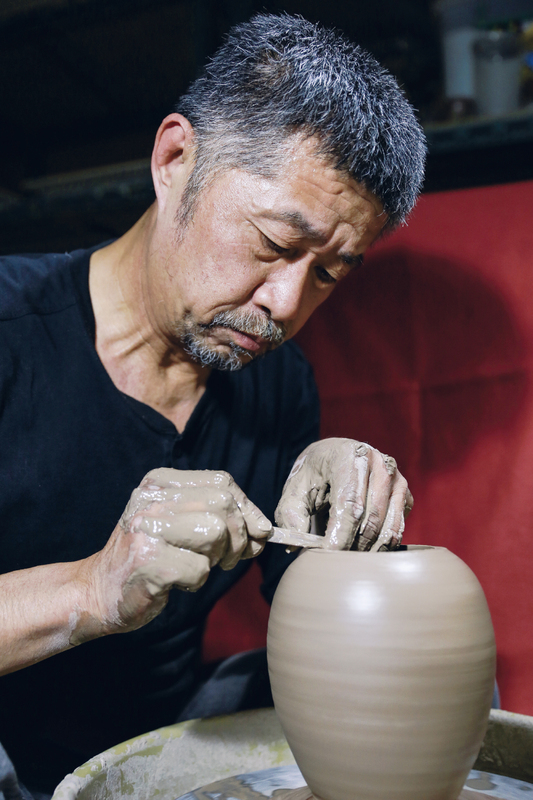 But when master ceramist Li Zhi­hao established a creative base, he instead chose San­xia. Li, who originally studied sculpture and started his career in the field, took a job at a pottery by chance. Since he tends to be led by his passions, Li found himself working there for the next decade, accumulating a thorough understanding of pottery making techniques. Different types of clay, moreover, produce varied surface textures and patterns. The ash from the firing process also lends the pieces unique coloring, giving Li’s creations a natural, unadorned appearance. But it is the subtle details that reveal the extraordinary attributes of his work. Through its use in different settings—whether as part of tea sets or table settings or as decorative objects—Li’s ceramic art reveals an effortless beauty against the backdrop of daily life. Culture Art and Nature (CAN), a local community advocacy group, has been intimately involved with San­xia’s cultural preservation efforts and creating a historical record of its past. The group’s founder, Jeffery Lin, grew up in the area, and when he returned to San­xia he had to get to know it all over again. In the process, he discovered many facets of local culture that were worth treasuring. Through interviews and written documents related to San­xia, over a six-year period CAN pieced together 20 stories that shed light on the town’s traditional industries. Lin discovered that although local craftsmen retain a mastery of their craft, they face a common struggle to preserve and pass on those skills. Lin believes that ensuring the future of these cultural legacies will require finding their worth for a new generation. CAN, therefore, is helping to organize educational activities to cultivate new interest. As a first step, CAN focused on instilling appreciation for local culture locally. 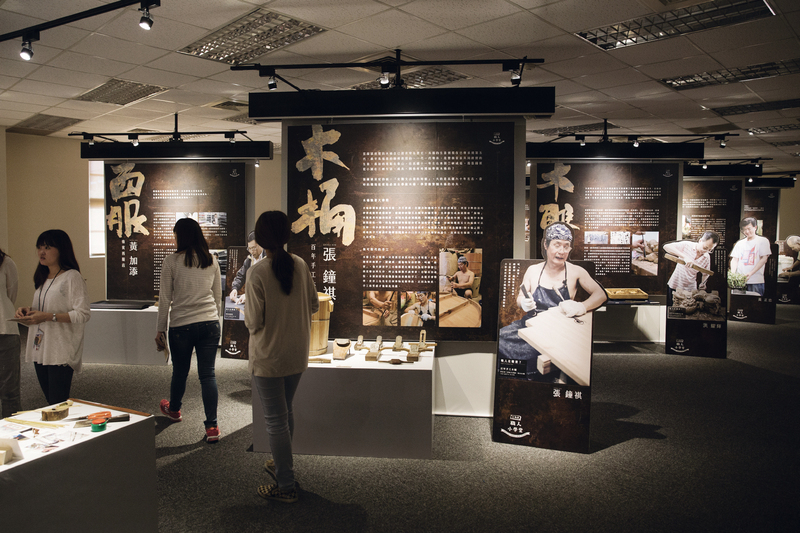 In 2015, it organized an “artisans’ concerto” exhibition that toured schools, putting the written records to good use by introducing the history of local crafts to students. The next step featured demonstrations of traditional craft techniques at the schools and was intended to spark students’ interest in learning about traditional crafts. 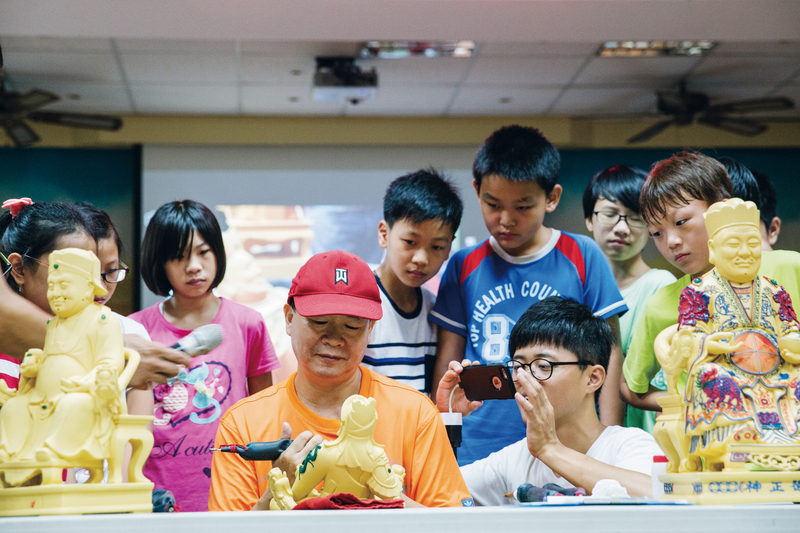 As well as promoting active-learning and demonstrational activities, CAN’s programming team has also developed a series of special courses at local schools, including a broadcasting program at Wu­liao Elementary and a program at Long Pu Elementary that facilitates interviews with seasoned artists by student reporters. Inviting artisans to schools and encouraging students to explore the community is resulting in lively cultural exchanges. In order to promote the idea of abandoning old educational frameworks and reforming education through imagination, CAN and the National Academy for Educational Research have been working to flesh out the idea of using the local craft community as a classroom and using exhibitions as a platform for expanding imaginative educational concepts. They hope that by combining teachers from within the school system and the ideas of educational specialists they can find new educational possibilities. In order to promote these ideas, they also participated in the Za Share EXPO for Innovative Education 2016, Asia’s largest innovation and educational exposition. The San Yi Metalworking Studio is an excellent example of CAN’s influence on traditional industries. 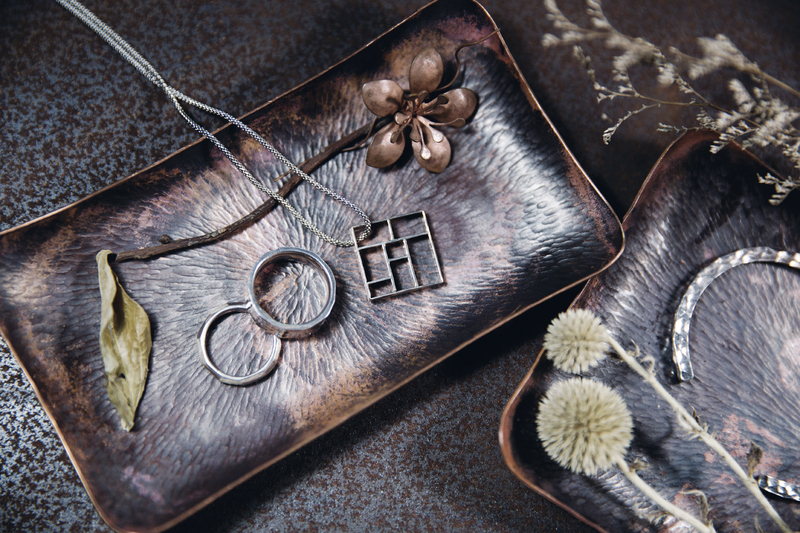 Wen Qing­long, a master silversmith, was trained as a traditional apprentice. Although he had a solid mastery of the skills of his craft, he could only find work making items to order on a case-by-case basis. With the help of CAN, however, he began to see beyond this traditional dynamic. He founded an independent studio and developed his own brand of design products, allowing him to engage in artistic creation firsthand. He also works to cultivate an appreciation for his craft through interactive demonstrations and hands-on experience sessions. By continuing to introduce new possibilities to local craftspeople, CAN hopes to continue to make use of local resources and find new meaning in old arts. 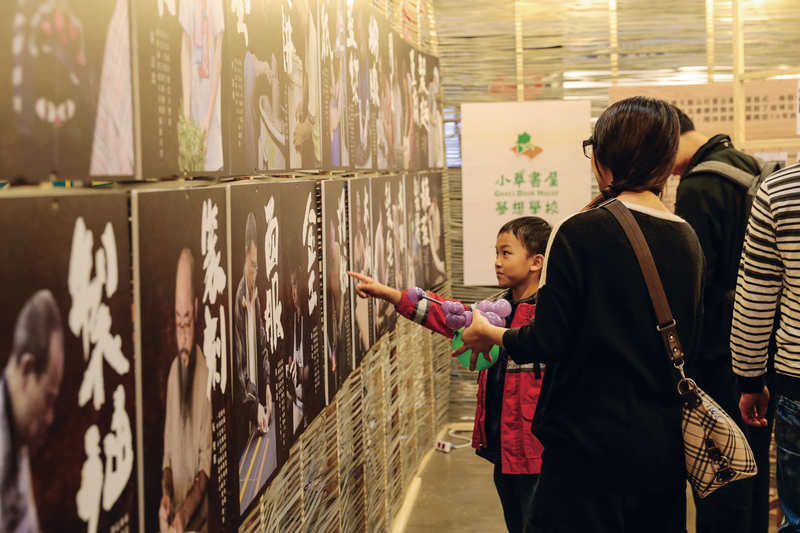 In addition to their efforts currently underway in San­xia, CAN has also set up Da San Ying Cultural Tours, a travel platform for excursions that connect San­xia to the neighboring towns of ­Yingge and Daxi. The three towns, long established along the Da­han River Valley, are responsible for the development of San­xia indigo dyeing, ­Yingge ceramics, and Daxi wood carving, and each possesses a distinctive craft culture. The tours are helping to popularize the culture and history of the traditional industries of the three localities. Ten percent of all proceeds from the tours is donated to local nonprofit organizations and provides funding for sustainable development projects for both the towns and the surrounding countryside. Cultural tourism thus becomes a vehicle for social change. By compiling a cultural record, rethinking education, reviving traditional industries, putting tourism to work, and responding to public concerns, CAN is taking a multi­pronged, innovative approach to finding contemporary value in traditional crafts and discovering the potency of change. The varied plans for revitalization are infusing the old city of San­xia with new vibrancy powered by old and new alike. The town is ready for a future of endless possibilities.